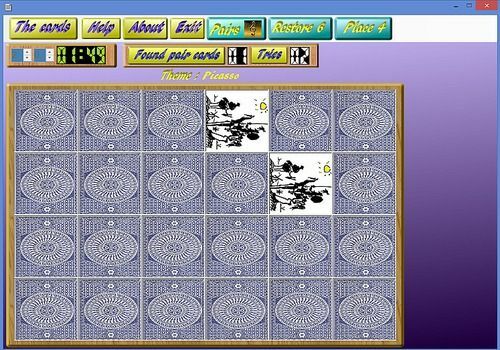 The game consists of four steps, each of which can be played separately. Find the pairs of cards. maps: scientists, sportsmen, artists, geometric forms, various forms and flags. This step consists of finding all the pairs of musical cards, each card playing a melody. A panel with six cards is displayed for 20 seconds and then hidden. A panel of eight cards is displayed for 20 seconds and then hidden. a panel of four cards is displayed, you must find the original location of the four cards. Look carefully at the color sequence played by the PC. It's your turn now! It sounds very easy... but still! The famous Memory game "Memory", customizable with your photos to entertain adults and children.